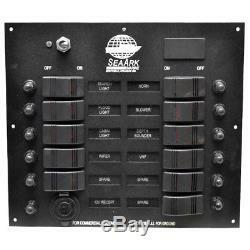 SEAARK BLACK 11 X 9 5/8 INCH ALUMINUM ILLUMINATED BOAT SWITCH BREAKER PANEL. 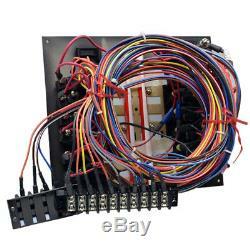 Boat part number 1045509 is a NEW, out of the box, SeaArk switch / breaker panel, part number unavailable. Constructed from black textured aluminum, this panel measures approximately 11" W x 9 5/8" H and requires an approximate 5 deep cutout. Features On/Off Search Light, Floor Light, Cabin Light, Wiper, (2) Spare, Blower, Depth Sounder, VHF; Momentary On/Off Horn; and On/Off/On Spare Carling rocker switches. Each of these switches is accomodated with black-booted push-to-reset breaker buttons. Also features On/Off toggle switch (we believe this is the main switch; however uncertain) and 12V Marine power receptacle. The labels are LED illuminated. Measurements: 11" W x 9 5/8" H. Holes with 5 1/4" x 4 5/8" apart center on center. Panel reads, For Commercial use only, Do not use hull for ground. Equipped with (1) 20-gang and (1) 8-gang terminal blocks. On/Off : Search Light (15A), Floor Light (15A), Cabin Light (10A), Wiper (10A), (2) Spare (10A), Blower (10A), Depth Sounder (5A), VHF (10A). Customers please note every computer shows colors differently. Instruction / installation manual not included. A Message from Great Lakes Skipper. We stand behind our products and maintain great relationships with our customers. The item "SEAARK BLACK 11 X 9 5/8 INCH ALUMINUM ILLUMINATED BOAT SWITCH BREAKER PANEL" is in sale since Tuesday, July 9, 2013. This item is in the category "eBay Motors\Parts & Accessories\Boat Parts\Electrical & Lighting". The seller is "greatlakesskipper" and is located in Racine, Wisconsin. This item can be shipped to United States, Canada, United Kingdom, Denmark, Romania, Slovakia, Bulgaria, Czech republic, Finland, Latvia, Lithuania, Estonia, Australia, Greece, Portugal, Cyprus, Slovenia, Japan, China, Sweden, South Korea, Indonesia, Taiwan, Belgium, France, Hong Kong, Ireland, Netherlands, Poland, Spain, Italy, Germany, Austria, Israel, New Zealand, Philippines, Singapore, Switzerland, Norway, Saudi arabia, United arab emirates, Qatar, Kuwait, Bahrain, Croatia, Malaysia, Chile, Colombia, Costa rica, Panama, Trinidad and tobago, Guatemala, Honduras, Jamaica.